The federal government’s securities fraud suit against Daniel C. Ustian, former chairman and CEO of Navistar International, can proceed in spite of objections raised by Ustian’s attorneys, a federal judge has ruled. Ustian had promoted a unique diesel exhaust emissions solution. But the Securities and Exchange Commission has charged in its suit that he knew it couldn’t work, with subsequent losses to company investors. Federal Judge Sara Ellis, of the Northern District of Illinios, made the ruling earlier this week, reported the Springfield (Ohio) News-Sun. From late 2009 and for several years after, Ustian said an approach called Advanced-EGR (exhaust-gas recirculation) would meet federal Environmental Protection Agency standards. But the SEC says continued testing by Navistar engineers showed it wouldn’t work. 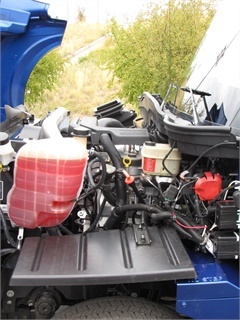 Meanwhile, Ustian led a marketing assault on competitors who used selective catalytic reduction, the exhaust aftertreatment requiring urea (diesel exhaust fluid) injection, as inconvenient and expensive. Navistar investors revolted when serious problems with A-EGR became known, customers complained, sales sagged, expensive warranty claims caused losses for the company, and stock value fell. Ustian was dismissed in August 2012, and last year Navistar paid a $7.5-million fine to the government for violating emissions rules. However, Ellis also ruled that the SEC didn’t sufficiently support allegations that Ustian is liable for statements to investors in 2012 at an analyst conference call, and so cannot proceed on those claims. The SEC suit does not address financial losses suffered by truck owners due to the A-EGR diesels’ lack of reliability. Navistar diesels now are equipped with SCR equipment supplied by Cummins, and Cummins diesels are popular options. Navistar continues to work to reduce losses and regain sales. In September, it was announced that Volkswagen Truck & Bus is taking a 16.6% equity stake in Navistar International Corp. as part of a “wide-ranging strategic alliance” that will initially focus on providing powertrains for Navistar trucks starting in 2019.